MARTHA SASINOSKI AND DAUGHTER SEE FANTASTIC SHOW! I received the two photos above, the nice "mother-with- daughter-and-Dave-with-Gibson-Les-Paul" photo to the left, and the photo below from Martha Sasinoski. The attached photo's are from the Wheeling WV show on 7/5/09. My daughter and I had the pleasure of having our photo's taken with REO for the I Love All Access. I think you asked my daughter if she was 12, she got a kick out of that, because she is actually 18- same difference though. Anyways, I thought that you might like the pics, I know we do!! The concert was fantastic; we catch it every year that you guys are close to Pittsburgh, Pa, and can't wait until you roll through a venue near us again. Until then, stay Healthy & Keep on Rockin!! Very cool photos and nice story Martha. Seeing that photo of you ... your daughter ... and Dave with the Les Paul Guitar ... I've got to say that this has hit a soft spot in my big rockin' REO heart! Glad to hear you had a fantastic time. Yes ... I agree it does not matter if you are 12 or 18; it's the same difference ... especially at the REO show. 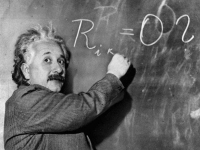 Above is an actual photo of Einstein and as you can see ... he has written the "R" and "O" and has nearly figured out the theory. He just needed to add the "E" in the middle in order to make it REO! He was so close! Well ... since he is no longer with us ... we REO fans, go to the show, and discover the theory for ourselves. Einstein would have been proud of us ... and no doubt an REO Speedwagon fan if he were with us today. ... and 18 is a pretty cool age to be ... at the REO Speedwagon show.